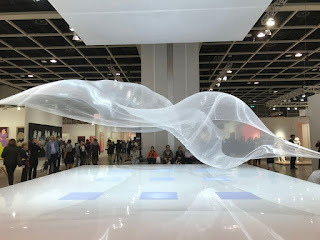 This afternoon I had an opportunity to preview Art Basel and this year was perhaps more commercial than ever. Usually the media have a chance to quickly wander around for an hour or two before VIP clients come in, but today there was no such head start. 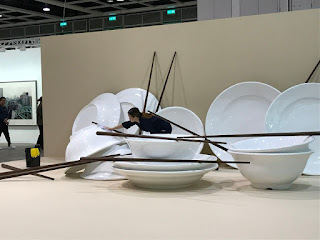 Instead at 2pm the doors were flung open -- not without security being hawk-eyed about people carrying backpacks -- and everyone flooded in, reporters and collectors alike into two floors in the Hong Kong Convention and Exhibition Centre. At about 3.30pm the first sale of the day was already made -- a 1975 Willem de Kooning painting named Untitled XII sold for US$35 million. 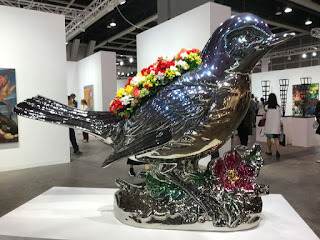 Throughout the afternoon I saw many well-heeled clients -- or as my colleague liked to call them Beijing Bourgeois Bling -- were talking to gallery staff about pieces they liked, and no doubt prices too. 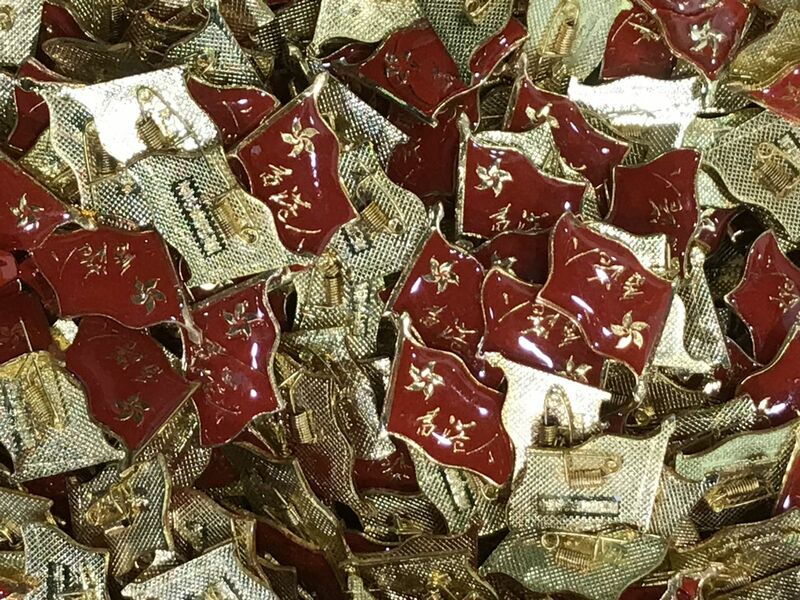 Another colleague reminded me that many of these pieces sold were prearranged earlier. So much for impulse buying. The fair is really about the business of art, though we did see a few pieces that were interesting. 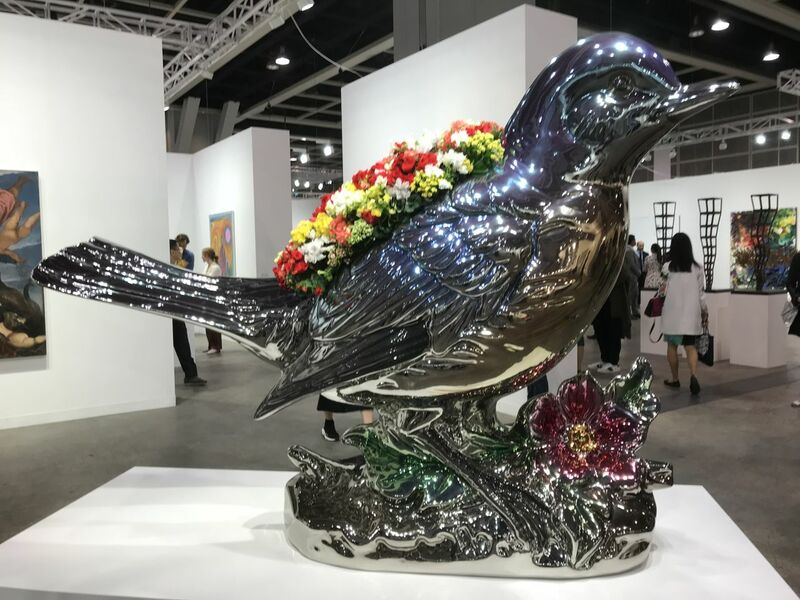 This year the biggest name is Jeff Koons, and he was showing some pieces, including a massive bird made of stainless steel decorated with real flowers called Bluebird Planter. 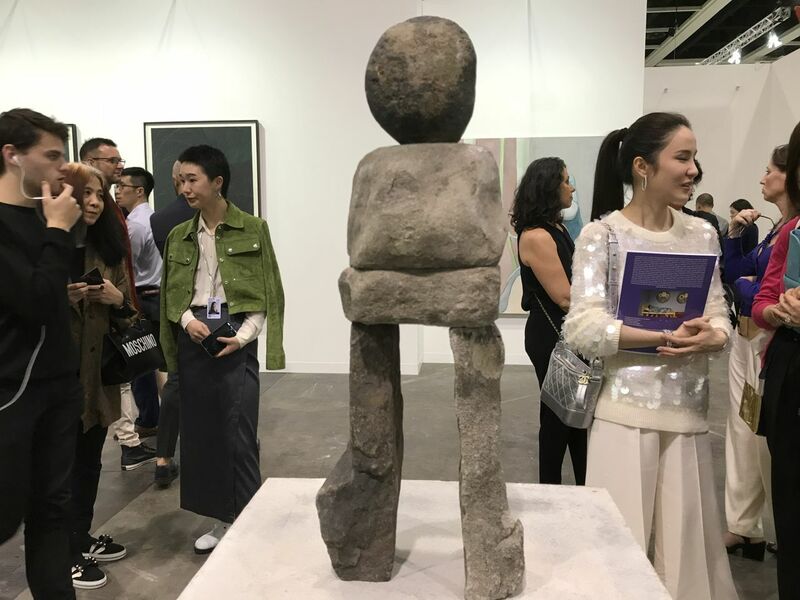 There were a few large works called Encounters pieces that are meant to be more accessible and usually catch people's attention. Shinji Ohmaki's Liminal Air Space-Time is like watching fish swim in a tank -- a light white fabric billows gracefully up and down, kind of like a massive jellyfish bobbing in mid-air. Another Encounters work is Start. Stop by Subodh Gupta, featuring tiffin boxes and pots riding on sushi belts in concentric circles. 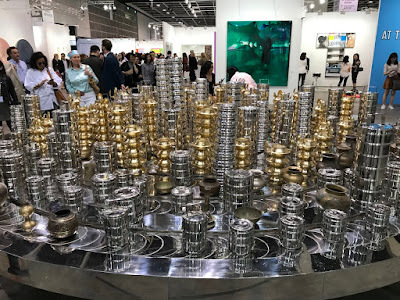 The artist recalls the fate of the "dabbwallas", the men who would courier these tiffins filled with home-cooked lunches in a rapidly changing urban environment. Dining is also the theme of Chou Yu-cheng's Encounters piece Refresh, Sacrifice, New Hygiene, Infection, Clean, Robot, Air, Housekeeping, www.agentbong.com, Cigarette, Dyson, Modern People. On the platform are giant plastic white bowls, plates and chopsticks and a woman in navy blue overalls wipes them like performance art. In front is a Dyson robot vacuum cleaner that wanders on its own on the stage. Another sculpture looked like an inukshuk, a sculpture of rocks put together by the Inuit that is meant to point the direction to something. But this one here at Art Basel was armless. Looks similar to an inukshuk, right?